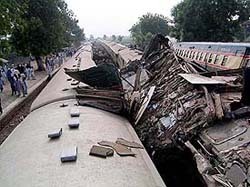 In a deadly pre-dawn pile-up, three passenger trains collided at a station in southern Pakistan today, killing at least 128 persons, most of them in their sleep, and injuring nearly 200 in the country’s worst rail accident in 15 years. The BJP today took exception to NDA convener George Fernandes’ criticism of the RSS and charged him with crossing his limits. Despite Washington’s strident opposition to the G-4 Framework Resolution on United Nations Security Council expansion, positive signals are emanating from the United States which hosts Prime Minister Manmohan Singh this weekend. Mr George Fernandes should refrain from interfering in the affairs of the Sangh and the BJP. After months of speculation, the Congress today appointed former Lok Sabha MP Shamsher Singh Dullo as the new president of the Punjab Pradesh Congress Committee. The police said today three of the four bombers who carried out last week’s London blasts were British nationals of Pakistan origin, raising the prospect that western Europe may have suffered its first suicide attack. Thirtyfive eggs of the emu bird lying in the bird’s enclosure at Chhat Bir Zoo may never see life, thanks to the laxity shown by the zoo authorities in arranging for an incubator for artificial hatching of the jumbo eggs (each weighing about 600 gm). 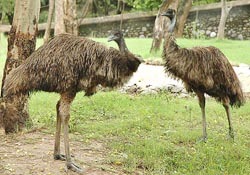 A pair of emu strut about in their enclosures in Chhat Bir Zoo, near Chandigarh. — Tribune photo by Manoj Mahajan.